MONTPELIER, Vermont, September 20, 2012 (ENS) – Children who love to eat tuna fish may be at greater risk of mercury poisoning than anyone has realized, finds the first study on mercury in school lunches published Wednesday by the Mercury Policy Project. The human nervous system is very sensitive to all forms of mercury. Research has shown that children poisoned by mercury may develop problems of the nervous system with learning and cognitive impairment, and suffer disorders of the digestive system and kidney damage, according to the federal Agency for Toxic Substances. The report, “Tuna Surprise,” contains the first test results for mercury in tuna sold to schools and assesses children’s mercury exposure from canned tuna. Mercury Policy Project researchers tested the mercury content of 59 samples, representing eight brands of tuna, sold to schools in 11 states. 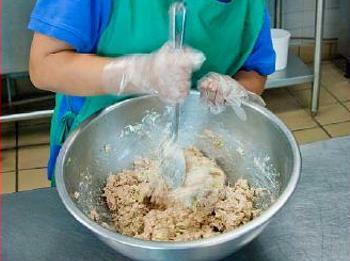 An inexpensive and nutritious low-fat protein source, canned tuna is served through the federally subsidized school lunch program. And schools may be switching to leaner protein sources this fall as they implement the new school lunch standards. Independent studies, not available when government advisories were issued eight years ago, indicate that adverse effects of methylmercury occur at much lower levels of exposure than previously thought. Canned tuna is by far the largest source of methylmercury in the U.S. diet and accounts for nearly one-third of Americans’ total exposure to this toxic mercury compound. “As far as we know, no one has previously tested this market sector,” said Michael Bender, MPP’s director. Testing of tuna sold to schools showed that the tuna contains mercury levels similar to what other investigations have found in canned tuna sold in supermarkets. Albacore or “white” tuna had much higher mercury levels than did “light” tuna, and mercury levels in both types were highly variable. The report advises schools and parents not to serve any albacore tuna to kids and to limit consumption of light tuna to twice a month for most kids and only once a month for smaller children, under 55 pounds. One specific warning in the report is to avoid tuna from Latin American countries, particularly Ecuador, as it tested higher for mercury content than tuna produced in other countries. Currently, American kids eat twice as much tuna as they do any other kind of fish, and one out of every six U.S. seafood meals is canned tuna. Dr. Groth, an environmental health scientist based in Pelham, New York, analyzed a variety of scenarios in which children of different ages ate different amounts of tuna with different mercury levels, and examined the relative exposure and risk from each scenario. Exposures in those scenarios ranged from less than one-quarter of to more than 40 times the current federal definition of safe exposure. The mercury in tuna comes from two sources – human activities and natural processes. Methylmercury is absorbed by algae in ocean water and becomes more and more concentrated as it moves up the food chain – small animals eat the algae, small fish eat the small animals, medium fish eat the smaller fish and top predators such as tuna that eat the medium-sized fish have the highest concentrations of mercury in their bodies. No child should eat tuna every day and children should not eat albacore tuna. Albacore or “white” tuna contains triple the mercury level of light tuna; nothing justifies tripling a child’s mercury dose. Children weighing more than 55 pounds should not eat more than two servings of light tuna per month. This amount of tuna (six ounces) is more than the average child currently consumes; the mercury dose it contains is acceptably low in risk. Children up to 55 pounds should consume no more than one tuna meal per month. Because of their smaller body size, an added margin of caution is appropriate for younger children. Parents and schools should offer children other seafood choices, such as shrimp and salmon, which are just as nutritious but contain far less mercury. 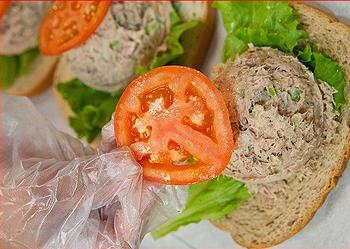 The U.S. Department of Agriculture’s School Lunch Program should phase out commodity purchases of canned tuna, and replace it with lower-mercury alternative seafood items and other extra-lean protein sources. Parents should monitor their children’s canned tuna consumption at school and ensure that the total consumed at home and at school does not exceed the recommendations for exposure. “Tuna Surprise” was co-released Wednesday by the Center for Science in the Public Interest, Physicians for Social Responsibility, Coalition for Safe Minds, Environmental Health Strategy Centers, Got Mercury?, Clean Wisconsin, Massachusetts Clean Water Action, Vermont Public Interest Research Group and the European Environmental Bureau.